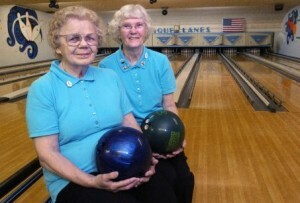 Two great-grandmothers from Grand Rapids have become state bowling champions. The women are 86-year-old Emma Dausman and 69-year-old Judy Conner. They won a Division 2 doubles title at the U.S. Bowling Congress’ Women’s Bowling Association state tournament. Dausman carried a 125 average but the octogenarian rolled games of 192, 189 and 173 for a personal-best 554 series in the tournament, which ended last month. Conner had games of 178, 203 and 176 for a 557 series. She carries a 161 average. With their combined handicap of 496 pins, they won by 32 pins with a total score of 1,607. Dausman told The Grand Rapids Press that Conner made her feel very relaxed by always encouraging her. I hope I want to go bowling when I’m their ages. I’ll probably still need the lane bumpers, though.